Partition is a result of a technique in applying the material, and the effect is, the obtainment of a tile with usable properties. Selection of the system depends mainly on the expected mechanical load, although crucial are also chemical resistance requirements and physical properties. To recapitulate, synthetic resin can be applied in all places. This of course requires consultation with manufacturing companies, that possess the right qualifications and experience. 1. The concrete bedding should be done according with PN 62/B-10144. 2. The thickness of the concrete base and reinforcement must be compatible with the amount of the expected usage requirements. 3. The concrete base placed on the ground must possess the standard isolation anti-humidity standards. 9. Required slope of tile should be shaped in the concrete bedding. 10. The outer layer of cement milk must be removed. 11. 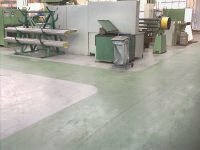 Cement bedding should be homogeneous, without fissures, cracks and left overs, dust and any loose fragments must be removed. 1. 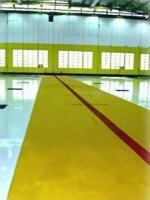 Epoxy tiles should be placed after the completion of all building works, this includes last finishings & installations. 2. The area in which the tiles are being laid must be excluded and secured from any access. 6. The area should be ventilated (gravitationally or mechanically).